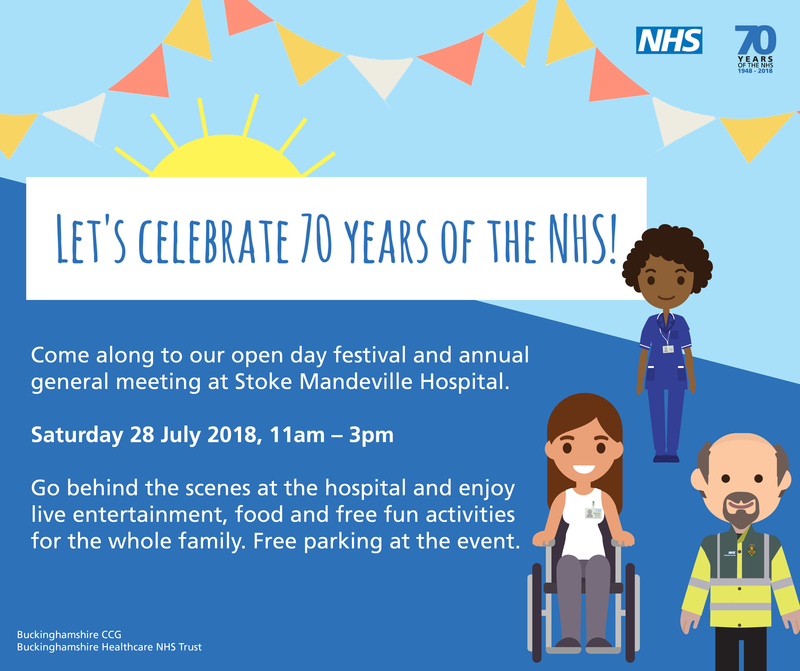 Buckinghamshire Clinical Commissioning Group (CCG) and Buckinghamshire Healthcare NHS Trust (BHT) and are celebrating the NHS’s 70th birthday by inviting the public, staff, friends and family to an open day festival and joint annual general meeting (AGM) at Stoke Mandeville Hospital on Saturday, 28 July, from 11am-3pm. The open day will let people go behind the scenes at the hospital and enjoy live entertainment, food and free fun activities for the whole family. A central health fair will feature information stands by many of the Trust’s clinical departments as well as other health and care partners, such as Healthy Minds Bucks, giving the public a closer look at what services are available to them locally. There will be mini-health checks available alongside information on how people can keep themselves and their families fit and healthy. Visitors will be able to go behind the scenes by booking onto tours, including tours of the mortuary and day surgery at Stoke Mandeville Hospital. There will also be a number of activities for children including a teddy bear trail through the hospital, with prizes to be won. Festivalgoers can also enjoy a variety of performers including local band OMJ who will be playing jazz through ages, transporting people from the 1940s through the past 7 decades to the present. The joint AGM is planned to run from 11.45am to around 12.30pm. This is also open to the public who will be able to hear about BHT and the CCG’s work over the last year. 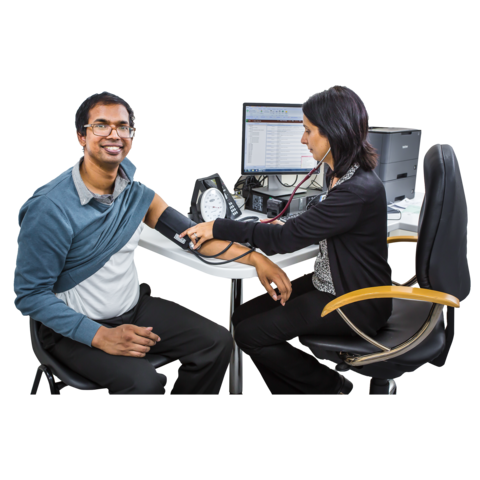 NHS Buckinghamshire Clinical Commissioning Group is improving access for patients who need to book routine appointments with their doctor. From October 2018, some surgeries in the county will be offering extra appointments. Although it will not be practical to offer these at every surgery, we will ensure they are available in your local area. “We would like to adapt this service so as to offer greater choice for patients, with fast, responsive and high quality care tailored to individual needs. “We believe that by helping people to make informed lifestyle choices we can work with patients to maintain their health and wellbeing so that they can lead the most independent and fulfilling lives possible. For us to be able to improve the access patients have to General Practice we would like to hear the views of the public and patients. Please let us know what you think by 30 June by completing our short survey – click here to take part. An estimated 1,200 people with a learning disability die from preventable illness every year. On average women with a learning disability die 18 years sooner, and men with a learning disability die 14 years sooner than the general population in England. That’s why this Learning Disability week (18-24 June) events are happening across the country to focus on improving healthcare for people with a learning disability. 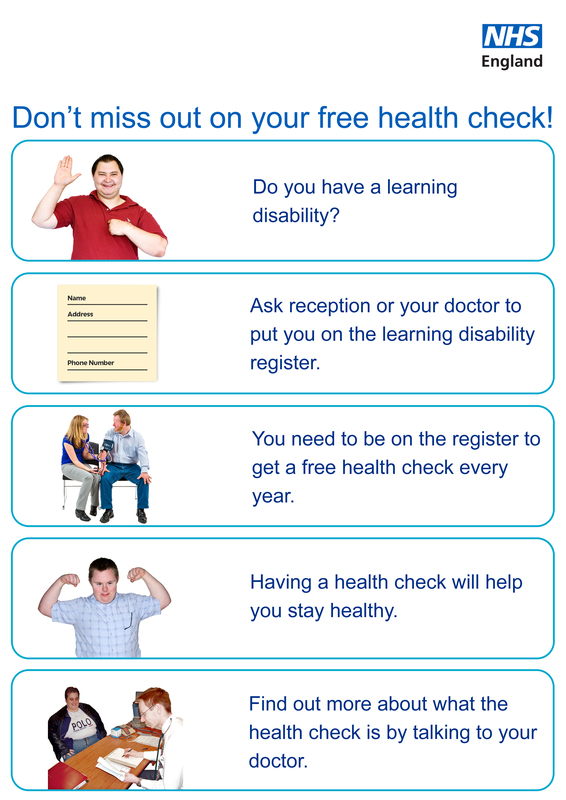 As part of the county’s ‘Transforming Care Partnership’ group; GP’s, the County Council, Buckinghamshire Clinical Commissioning Group, and many other health and social care professionals in Buckinghamshire are backing Learning Disability Week by encouraging anyone with a learning disability or autism to register with their GP for an Annual Health Check. Dr Sian Roberts, Mental Health and Learning Disability Clinical Director, said: “Annual Health checks are one way of making sure that people with a learning disability stay as healthy as possible. The checks can pick up early signs of a problem, and even prevent problems arising in the first place. It’s easy to arrange just contact your surgery and ask how you can make an appointment for this important health check. Lin Hazell, Cabinet Member for Health and Wellbeing, said: “People with a learning disability get worse healthcare than people without. Every single year hundreds of people with a learning disability die when their death could have been avoided if they had got good healthcare. For an easy read guide to getting a health check, please click here. A new film has been launched in Buckinghamshire to show how people affected by dementia can use creative pursuits and activity to help improve their quality of life. The locally made film, entitled ‘I Am Still Me’, forms part of ongoing work by NHS Buckinghamshire Clinical Commissioning Group and Buckinghamshire County Council to raise awareness of the condition. It focuses on the importance of supporting people living with dementia and their carers by helping them find new ways to communicate and enjoy memories through creative and social activities. These can include singing groups, artistic activities or watching performances. It also considers the difficulties experienced by carers of people living with dementia, and how vital it is that they find lifelines to relieve the pressure on them. Click here to view I Am Still Me . A number of local groups and activities which people can get involved with are featured over the course of the film. It was produced by Dr Mahuya Kanjilal, who has extensive experience of working on films highlighting health and social care issues as they impact the BME community. The project was also supported by NHS England South Central. The film was screened at a special event earlier this year, followed by a Q&A session with a panel of key members of the project, including GP Dr Sian Roberts, who gave advice and insight into the challenges surrounding dementia and caring for someone with the condition. Dr Roberts, Mental Health and Learning Disability Clinical Director for Buckinghamshire CCG, said: “This film aims to show that people can still lead meaningful and fulfilled lives when they live with dementia, and activities like the ones highlighted can make such a positive difference to them. Living Well With Memories, which features clinical advice on prevention and management of dementia. My Life, My Memories, which focuses on the experiences of people affected by dementia from different communities. Dr Shona Lockie is a GP at Water Meadow Surgery in Chesham and Clinical Director for the Medicines Management Team at NHS Buckinghamshire Clinical Commissioning Group. So, what is hay fever? It’s a common condition in the UK, affecting one in five, caused when the body overreacts to allergens, like pollen, from grass or flowers. It usually hits in the spring and early summer (now is a prime time), leaving people with symptoms like sneezing, itchy eyes, runny or blocked noses. The severity of symptoms varies from person to person. This year the situation is worse than usual, thanks to the so-called ‘pollen bomb’ – a simultaneous release of pollen from various sources, including birch, plane and oak trees, which seems to have been delayed because of the erratic weather we’ve had. The good news is, in most cases there is no need to visit your GP as your pharmacist has a range of effective treatments to recommend. Antihistamine tablets can ease eye or nasal symptoms; eye drops can also help. Over-the-counter steroid sprays like beclomethasone and fluticasone can treat all symptoms (but are best started a month before hay fever season begins). If you are worried about the cost, ask about ‘own brand’ labels, which may be cheaper than branded products but are still effective. 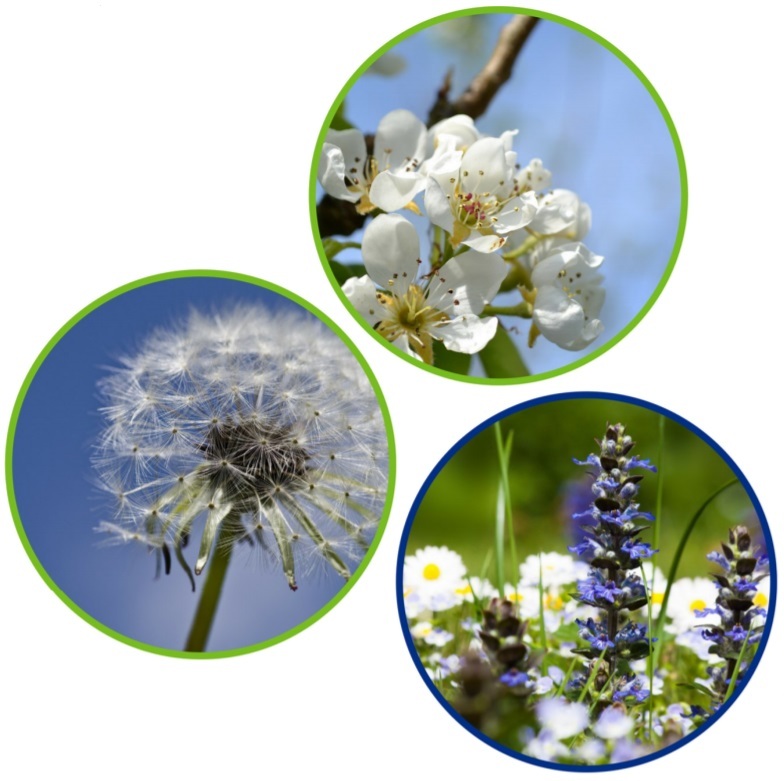 Some people must take extra care with hay fever if they have a condition affecting their breathing, like asthma for example, or Chronic Obstructive Airways Disease (COPD). Make sure you always have your reliever inhaler (usually blue) handy for emergencies, and if you also have a preventer inhaler, please use that as prescribed. If you experience breathlessness which your inhalers can’t relieve easily, contact your GP. Wear wraparound sunglasses to keep pollen from your eyes. Shower and change clothes after going outside to wash pollen off. Stay inside when the pollen count gets bad, especially at dawn and dusk. Keep windows and doors shut where possible. Keep car windows shut and get a pollen filter for the air vents. Cut grass or walk on grass. Smoke or be near it – it worsens symptoms. Keep fresh flowers in the house.